A shrubland is a plant community in which shrubs are the dominant vegetation. 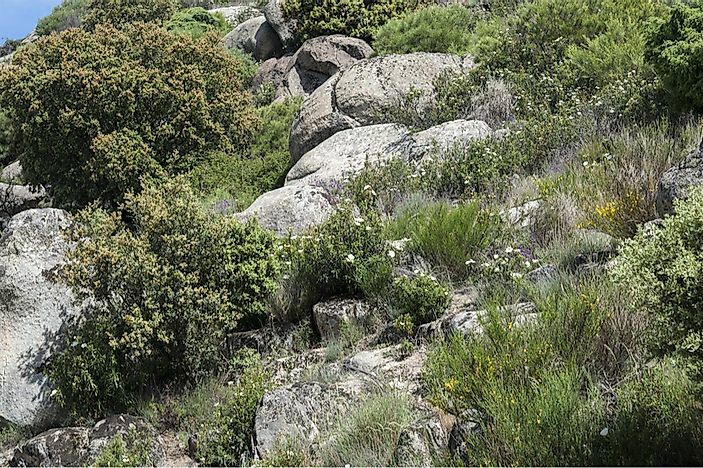 An example of Mediterranean shrubland in the Guaddarama Mountains near Madrid, Spain. A shrubland is a specific type of ecosystem, which is identified by its large amount of shrubs and shrub-like plants. Other plants found within shrubland habitats include grasses, bushes, and other herbaceous plants. Given the type of natural vegetation, a shrubland may also be known as a scrubland, the bush, or a heathland. Most shrublands develop in Mediterranean climates, where the weather is mild and wet during the winter and dry during the summer. These ecosystems can represent a fully developed habitat or may be one of the stages of ecological succession, which is the process of change that habitats experience over time. When a shrubland is the result of ecological succession, it is generally due to the destruction of a more advanced plant ecosystem. Some of the most common causes of this destruction include deforestation, fires, agriculture, and livestock. A shrub is a plant which dominates the shrubland landscape and is similar to a tree in that it is characterized by its woody appearance. However, this plant is smaller than a tree and grows to a height of no more than 16.4 feet. Additionally, shrubs begin to develop branches toward the base of the main stem and may have several large branches. Shrubs are also known as hedges, bushes, and woody plants. Although most shrublands are classified as Mediterranean shrublands, this ecosystem may also be categorized into a number of other biomes. Some of these biomes include: desert shrublands, dwarf shrubs, and interior shrublands. Mediterranean shrublands are the most common and can be found in six areas of the world: the Mediterranean Basin in Spain, France, and Greece; the coastal scrublands of California in the United States; in the western and southern regions of Australia; along certain areas of the coast in Chile; in the steppes regions of central and western Asia; and in the western coastal area of South Africa. These shrublands are unique in that they exist within coastal areas, where they are exposed to high levels of salt in both the air and soil. Additionally, Mediterranean shrublands sit at a slightly higher elevation than the land surrounding them. Typically, this lower-elevation land consists of deserts and sometimes temperate forests. Desert shrublands are located in desert regions with hot, humid climates and dry, sandy soils. The plants in these shrublands often appear more scarcely spread out compared to those found in wetter regions. The shrubs in desert shrublands typically grow deep roots in order to reach underground water sources. Additionally, these shrubs may have small or succulent leaves and thorns. Dwarf shrubs are those that grow to very low heights. Some of these may even appear to cover the ground, known as creeping shrubs. Dwarf shrubs grow most commonly in areas with high levels of acidity in the soil and in Mediterranean climates. In Japan, forests of dwarf bamboo have taken the place of large tree-filled forest ecosystems, as a result of deforestation. Interior shrublands, as the name suggests, grow further inland than other Mediterranean shrublands. These plants are able to thrive in ecosystems with little to no rainfall and low levels of nutrients in the soil. Since shrublands exist all over the world, the biodiversity within each is considerably different from one another. South Africa and Australia are home to some of the most diverse shrublands in the world. This wide range of biodiversity occurs because the shrubland ecosystems located in these countries have existed for a long time, which means the habitat is fully developed. Desert shrublands often have the lowest level of biodiversity recorded in the various shrubland biomes. This lack of biodiversity is due, in large part, to the hot and arid climates. The most common plant found in desert shrublands is the saltbush, which is able to hold large quantities of salt within its leaves. In addition, several species of cacti and other succulent plants are able to survive in these conditions. In the southwestern shrublands of South Africa, for example, researchers have identified approximately 8,500 plant species. Many of these plants are endemic to the region, having adapted and evolved in order to survive with the low nutrients available in the local soil. Some of the most common plants here include grasses, sedges, heathers, beans, daisies, orchids, and proteoids. The wide range of plant biodiversity has led to a significant number of animal species, particularly bird and insect species. Although seemingly detrimental to ecosystems around the world, wildfires are actually an important part of maintaining the ecological health of certain habitats. Wildfires serve to reduce and control the number of larger plants found in shrubland habitats. If left uncontrolled, these larger plants could spread throughout the shrubland ecosystem and prevent shrubs and grasses from growing. In essence, wildfires prevent shrublands from turning into different types of ecosystems, such as forests. Over time, many of the shrubland plant species have evolved to resist wildfires in a number of manners. For some plant species, the heat from the wildfire actually encourages the plant to produce flowers, which explains why some shrublands are filled with colorful blooms after a fire. In other cases, the seeds of shrubs are able to successfully regrow in ash-filled soil. Some shrubland plants have evolved a lignotuber, which is an enlarged piece of the stem located below the soil. This lignotuber remains undamaged during wildfires and is able to regenerate new stems after the fire has gone out. Agriculture, livestock, other human activity, and biodiversity loss are some of the biggest environmental threats currently facing shrublands. Shrublands are often utilized by local human populations as pasture or grazing area for livestock. Large livestock animals destroy the plants located here at a much faster rate than the ecosystem can compete with. Additionally, native plants are often replaced with more profitable crops, like wheat and corn. These changes result in drastic ecological degradation and prevent the shrubland from thriving and growing. In some cases, humans have also overhunted native animal species within shrublands, which causes an imbalance in the natural food chain. As a result of these factors, shrublands around the world have suffered irreparable damage and loss of biodiversity.